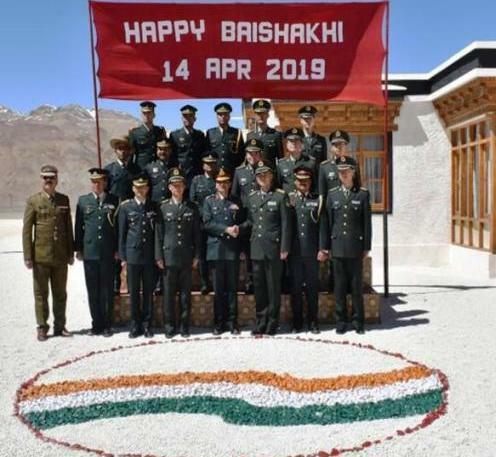 Leh(Ladakh),April 15 (Scoop News)-A Ceremonial Border Personnel Meeting (BPM) on the occasion of “Baisakhi Festival” was conducted on 14 Apr 2019 at the Indian BPM huts at Chushul-Moldo and DBO-TWD Meeting Points in Eastern Ladakh. While the Indian delegation was led by Brig VK Purohit and Col Prashant Rana the Chinese delegation was led by Sr Col Yin Hong Chen and Col Song Zhang Li. Both the delegations interacted in a free, congenial and cordial environment. The Delegations parted amidst a feeling of friendship and commitment towards enhancing the existing cordial relations and maintaining peace along the border. Both sides also sought to build on the mutual feeling to maintain peace and tranquility along the border.